I received my WLToys V686G 720p FPV (first-person-view) quadcopter two days ago and I am in the process of writing up a full review. While fact checking against the banggood website I stumbled upon this incredible RTF (ready-to-fly) quadcopter called the Scarlet Minivet and made by little known startup in the drone world “Wingsland”. Despite this they have managed to put together a complete package for under £390 delivered! The Wingsland Scarlet Minivet comes fully equipped and ready to fly! By complete package I mean it has everything you’d expect from a drone costing twice as much. A brushless gimbal ensures the footage is steady and allows you to shoot at the angle you want, even straight down. 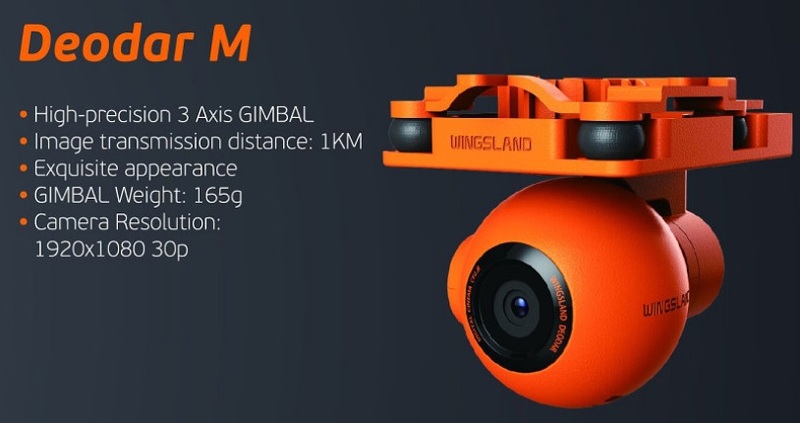 The gimbal features a built in Full HD 1080p camera with the ability to transmit footage back to the small, but high quality, FPV screen from up to 1km away! In terms of features this drone is a decent contender against the established models and I believe it can even compete with the DJI Phantom 3 Advanced. All for under half the price! The GPS chip allows it to return to home (RTH) automatically if signal is lost or the controllers batteries die. If the operator has to divert his attention elsewhere, or loses control, a flick of a switch will bring the quadcopter back to the takeoff point without incident where it will carefully land itself. This RTH process can be aborted at any time by flicking the switch back to retake control. RTH is not the only trick the GPS and onboard gyros allow. The Scarlet Minivet has heading/altitude hold and an excellent points of interest ability. Simply fly the drone to the subject, click a button and then fly to the radius at which you want it to circle the POI and, with a second click, the quad will automatically circle your chosen spot at the set radius with the camera pointed at the centre. Small screen is a bit of bummer but OSD is nice! The 2.5″ screen attaches nicely to the controller and overlays flight information (OSD is on-screen-display) such as height, speed, battery status, signal quality and power usage. Some may find it’s small size a bugbear so it is nice to know that the video transmitter in the quad has 8 preset frequencies allowing you to stream footage to other monitors such as Boscam and even Fatshark FPV goggles! On the back of the controller is the innovative gimbal joystick allowing you to easily frame shots as desired whilst retaining control of the quad. It looks to me to be similar to the Sony PSP sliding thumbstick. This is a near perfect package and at this price point it is unbeatable. However, there are a few things that potential purchasers need to be aware of. 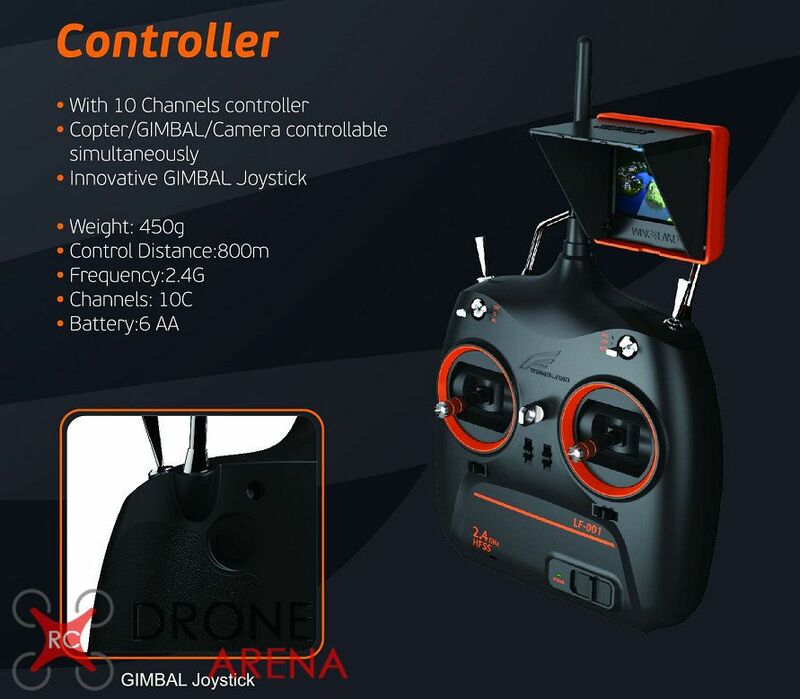 The Flight Controller and Gimbal software is still being developed and as such you may need to plug the quad into your PC and update it using the files and software found at the bottom of Banggood’s product page if you have any issues. This isn’t a show stopper but just something to be aware of. Despite the inclusion of a smart battery there have been a small number of reports of early models failing prematurely and at almost £50 these aren’t cheap. Banggood have, as always, been quick to honour the warranty and send free replacements out but you may want to pick an extra one up when ordering the quad to ensure you have a backup if the worst does happen. Shipping from China is usually around 10 days and that’s a long time to wait to be flying again. The Scarlet Minivet has a microSD card slot in the gimbal for recording the footage to a card but you’ll need to pick one up separately as unfortunately this must be the only thing not included in the box! There are doubts on the video range using the supplied screen but it is easy to mod with a higher quality aerial. This should help streaming footage reach the advertised distance of 1km. Flying “FPV” has increased in popularity over the last few years as lightweight camera quality and range have improved hugely. 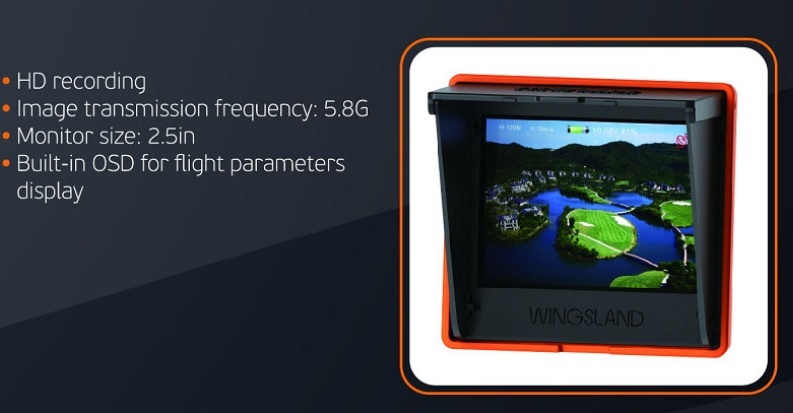 The Wingsland Scarlet Minivet is a great first quadcopter for those who don’t have the money for or don’t want to risk damaging a £1300 DJI Phantom 3 Professional but want the features of an advanced drone for aerial photography. It is on incompletegeek’s Christmas list and I will be sure to update with a full review if and when I get the chance to fly one. Amazon ups their Black Friday game for 2017! thanks for the review. I just received mine. I am wondering what micro sd card would be best. is class 10 ok? I notice this Samsung is class 10 but also UHS1 . is it compatible? is 128GB enough capacity for HD nature footage? Hi Tom, hope you’re enjoying the quad? The weak link with filming from a quadcopter is the quad’s battery not the sd card. Depending on the compression you could easily get away with a 8gb for a few flights. I’d go for a 16gb and spend the money saved on another couple of batteries to keep you in the air. SanDisk are the big name and what I’ve bought for my Runcam HD that will go on the Walker Runner 250. Go for a class 10 ultra or extreme (SanDisk’s top end cards) as the high bitrate when filming 1080p can easily overwhelm cheaper cards and their lower read/write speeds (even if they say they are class 10!). I highly recommend buying from a reputable dealer as the market is awash with fakes which won’t have the capacity advertised or perform as they should. Amazon is generally okay but look at the seller feedback if buying from the marketplace. Hope this helps! P.S. Check out the competition I’m running, for a chance to win some banggood points. Nice review. I never thought of using the fpv goggles that would be amazing! The new minivet 2016 version is out now. It has a 5 inch screen. But goggles would still be the best! After reading all the manuals, calibrated and all waiting time for gps up to more that 7, My minivet Scarlet has a launch problem. It cannot take off. All propellers are working but when start to throttle, it drifts or collapses. I bought this product yesterday. When I put in any SD card the camera stops functioning. If I start with one in the camera it never comes on. The screen stays snowy. Enter your email to subscribe to incompletegeek and receive new posts by email.